Well I was blown away. I watched this movie because it played at the cinema when it was the world movies festival. It was the only Korean movie so I didn't chose to watch this movie because the trailer was good or because I've hear it's good. One moment there was a smile on my face, the other moment my eyes were teary. It's a story that hits the hart. 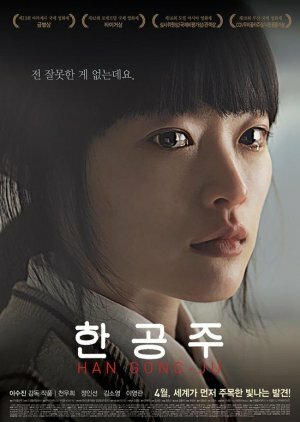 In the beginning the writer doesn't give us all the information we need to know what's Han Gong-Ju's mystery story and background. The flashbacks tell us what we wanted, or maybe didn't want to know. This movie is a little different. It's not the average Korean movie. What I like the most about the movie is the feeling I get from it. The movie/story feels 'real'. In Korean drama we often get a lot of lovey-dovy dramas and a lot of cry-with-buckets movies. But most of them are unreal and we let them go when finishing the story. Sometimes the truth is harsh. This one still stays in my mind, even if it's a few day ago that I watched it. The actors don't get a lot of make-up which shows the real beautiful Korean beauty. It's Chun Woo Hee second main role, I have never seen her act before but I'm totally convinced of her great acting skills. You'll see that she's very talented. The supporting roles were also really good. I'm looking forward to more of these good actors and other works of the director. I'm definitely a fan! The rewatch score is only a 4 because I think the movie is at it's best watching it for the first time because of the stepwise construction of the story. I think the director, the writer and the actors did a great job. I really recommend this movie.